It did not take long for our initiation into “life overseas” to begin, starting with the realization, about the fourth night we were there, that we were not the only ones residing in our house. We definitely had guests. It was insomnia that led me to this discovery. Usually I am not subject to any difficulty sleeping; in fact, most of the time I am one of those people who fall asleep within minutes of my head hitting the pillow. Cindy, on the other hand, tends to just get going around ten o’clock at night, finding bedtime the perfect setting for discussing the deep and arcane mysteries of our relationship. At first, I was convinced there had to be a strategy in this somewhere, that this was a deliberate, subversive, Chinese-water-torture-type technique all women are taught at an early age. (Clearly, when they separated us during those junior-high puberty talks, this is what the girls were laughing about in the other room.) Although there are times when I still have my suspicions, I eventually came to attribute this to nothing more sinister than differing biorhythms. In Kenya, though, something odd happened—Cindy and I traded places. She seemed to be able to fall asleep immediately, while I often laid in bed for hours, hard at work trying to determine the exact nature of every strange sound I heard, and then resolve myself to whatever fate that sound might be heralding. Whether it be robbers or revolution, at least I was not going to be taken unaware; for every possibility, I would lie there and devise a plan. There are two essential elements to a father’s job description—provide and protect, and I guess being in such a strange place pushed the protect thing into serious overdrive. I was deeply engaged in this useless activity when I first heard it. Something in the ceiling directly over my head. Something scurrying and furtive. Something undeniably rodent in quality. Have you ever noticed how the more you pay attention to a sound in the night, the louder it becomes? My high-alert listening soon had me convinced that whatever was tromping back and forth over my head had to be about the size of a small dog. This led to visions of some “rodent of unusual size” suddenly dropping through the ceiling tiles overhead and landing on my face. As I listened even more carefully, I was soon sure there had to be a whole team of them up there, running back and forth, back and forth, back and forth, engaged in some demented version of a rat soccer game. Just when I was thinking how glad I was Cindy was asleep and missing all this, she rolled over, pounded her pillow and muttered in an exasperated tone, “What are they wearing? Wingtips?” There was one brief moment of silence, then we both burst out laughing, one of those great, huge laughs energized by the sudden realization of a shared anxiety. We laid there, and between eruptions of laughter, hatched Plan-A calling for the use of our secret weapon. Being the neurotic suburbanite I am, I of course anticipated vermin-oriented problems long before our departure. One afternoon back home, while Cindy was shopping, I was wasting time in Brookstone, the mall equivalent of childcare for bored husbands. Here, among the vibrating chairs and ultimate nasal-hair trimmers, I found something truly useful. It was one of those ultrasonic devices that emits sounds humans can’t hear, but rodents can…. …and even though I listened for them every night thereafter, anticipating a sneak attack, they never did come back. The mystery of where they went was only solved months later when we told our neighbors about our cleverness. They looked at each other with one of those “Ah ha” kind of looks and said that explained teh line of little furry refugees they had seen that first week, bags in hand, cotton jammed in their ears, fleeing from our home, straight for theirs. The rest of the story is Judge family history…those mice were gone in a day…and the neighbors weren’t too happy about it…we’re still sorry, Bob and Bobbi…sort of. More stories to come on Thursdays. Judge, James (2001-09-10). 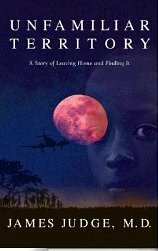 Unfamiliar Territory (Kindle Locations 665-674). Thomas Nelson. Kindle Edition. Love your story & the wingtips comment. The first time I cornered one behind the fridge with my broom and flashlight he was sitting on his haunches, looking up at me and trembling. I just couldn’t hit him. I have had no qualms getting rid of them ever since that first night.